Encouraged by incremental progress in six starts in 2018, Meyer Shank Racing announced Tuesday an expansion to running 10 NTT IndyCar Series races including the 103rd Indianapolis 500 this season, continuing with English driver Jack Harvey and technical partner Arrow Schmidt Peterson Motorsports. Shank's Ohio-based operation, which has enjoyed extensive success in sports car racing, is looking to take that next step with stronger INDYCAR showings in the No. 60 AutoNation/Sirius XM Honda. MSR is also backed by Jim Meyer, chief executive officer of SiriusXM. “We’ve been on a very controlled growth platform, meaning we’re not committing to more than we can afford,” said Shank (at left in photo above). “Our partners are stepping up now to allow us to do 10 (races), which we’re really grateful for. We need to step up now and show we’re capable of running in the top 10. I think we’ve got everything in place to be able to do that. 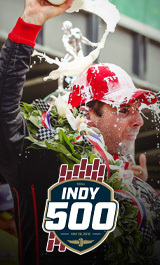 In addition to the Indy 500, MSR is planning to make nine road- or street-course starts at St. Petersburg, Circuit of The Americas, Barber Motorsports Park, Long Beach, the INDYCAR Grand Prix at Indianapolis Motor Speedway, Road America, Mid-Ohio, Portland and Laguna Seca. Harvey’s best finish in nine career series starts spanning 2017-18 was 12th at Long Beach last season. But the team saw glimpses of greater potential by running closer to the front at times. Harvey was in second place at the Indy 500 before he was forced to pit for fuel four laps from the finish and wound up 16th. The two-time Indy Lights presented by Cooper Tires championship runner-up also displayed excellent pace at Mid-Ohio and Portland. The Grand Prix of Portland stood out, as Harvey was quick in practice, qualified 13th and ran as high as sixth before finishing 16th. The 25-year-old driver from Bassingham, England (at right in photo above), expects stronger results just from the sheer experience he and his crew gained in 2018. Harvey, like Shank, is thinking top-10s. Harvey has intensified his offseason preparation by losing 24 pounds through intensified workouts with Fit Flex Fly trainers while adhering to a diet of enhanced nutrition. Shank appreciates seeing that kind of commitment from his driver. The end game eventually is to field an INDYCAR team that’s a consistent contender, like the IMSA sports car entry Shank will race in this weekend’s Rolex 24 at Daytona. If MSR can meet its 2019 goals, the next step would be to run full time in 2020. “We did six races last year, we’re doing 10 this year and hopefully the whole schedule next year,” Shank said. “But a lot of things have to happen for us to do the whole schedule with our partners. Harvey draws confidence from how everyone on the team is “singing from the same hymn book and same page,” led by Shank’s determined drive. “I really have enjoyed just getting to know him and getting to see how he works, his work ethic, and honestly it’s easy to see why he’s been so successful in the past,” Harvey said. “Hopefully we expand together. I believe in myself. I believe in him. Hopefully we’ll get to show that on the INDYCAR level. Harvey and Meyer Shank Racing are among those scheduled to participate in INDYCAR Spring Training at Circuit of the Americas in Austin, Texas, on Feb. 12-13. It is the only series-mandated gathering of full-season and some part-season entries prior to the first race. The 2019 NTT IndyCar Series, featuring 17 races, kicks off with the Firestone Grand Prix of St. Petersburg on March 10. It airs live at 1 p.m. ET on NBCSN and the Advance Auto Parts INDYCAR Radio Network.